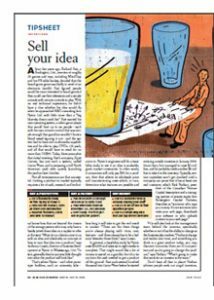 Sell Your Idea – published in Canadian Business Magazine – Nytric Ltd.
About five years ago, Richard Fast, a Burlington, Ont., inventor of roughly 20 games and toys, including MindTrap and Ice-FX table hockey, decided that the board-game genre was badly in need of an electronic facelift. Fast figured people would be more interested in board games if they could use their televisions and a simple console with remote controls to play. With no real technical experience, he didn’t have a clue whether his idea would fly when he approached R&D consulting firm Nytric Ltd. with little more than a “big blue-sky dream wish list.” Fast wanted his own operating system, a video game player that would host up to six people — each with his own remote control that was simple enough that grandma wouldn’t burst a blood vessel figuring it out — and the system had to have rich multimedia capabilities and be able to play DVDs. Oh yeah, and all that would have to retail for no more than US$99. Today, three years after that initial meeting, Fast’s company, Zapit Games, has just such a system, called Game Wave, and is preparing a full North American push after quietly launching the product last October. That’s where Nytric — and other prototype builders, such as university labs — come in. Nytric’s engineers will do a feasibility study to see if an idea is workable, given market constraints. In other words, if consumers will only pay $99 for a product, then that affects its wholesale price and manufacturing costs which, in turn, determine what features are possible and how long it will take to get the end result to market. “There are the three things you’re always playing with–time, cost, features–and there always has to be a balance between those three,” says Gussin. Don’t have all that in place? Nathan advises people seek out angel investors, who are a bit less risk averse. Some of that early money will probably be earmarked for filing a patent, which can cost between $10,000 and $20,000, depending on its complexity. Patents can take up to seven years to complete, and there may be competition, so it makes sense to file as soon as possible, says Don Cameron, a senior partner and patent specialist at law firm Ogilvy Renault in Toronto. “The first person to come up with the invention and file a patent application wins,” says Cameron. “Patents are the dogs and fences of today’s businesses. In yesteryear, you kept the thieves away with dogs and fences. Today and tomorrow, patents will protect business from thieving competitors who try to steal your ideas.” Not every idea is patentable, of course. It has to be new, non-obvious and, above all, workable. A levitating skateboard is not an invention until you’ve figured out how to actually make it levitate. In the case of Game Wave, the patents are owned by Zapit, even though Nytric did the grunt work. The console itself wasn’t patentable, as the concept already existed, but the guts of the system — making it work with six remote controls all working imultaneously — is. While it seems a little unfair that Nytric doesn’t control the patents, don’t feel too bad. The company typically takes an ownership stake in any ideas it helps build. That cuts down the upfront costs for inventors but also ensures a technical crew is always there to follow up in case something goes awry. In return, Nytric may take a 3% to 5% cut of the selling price — and its logo often appears somewhere on the product.